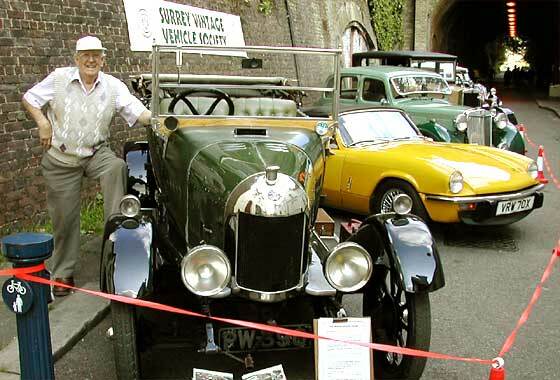 The SVVS was again invited by the Reigate Business Guild to display our vintage and classic vehicles in old Tunnel Road above the Reigate Caves in the support of the National Heritage Open Day Scheme. The event was held in conjunction with the Cave Society. The following text is by Chas Moody and the photos are by Chas Moody and Malcolm Bailey. Please click on any thumbnail picture below to see the full size picture. To return to the thumbnails please click the Explorer "Back" arrow (top left of screen). 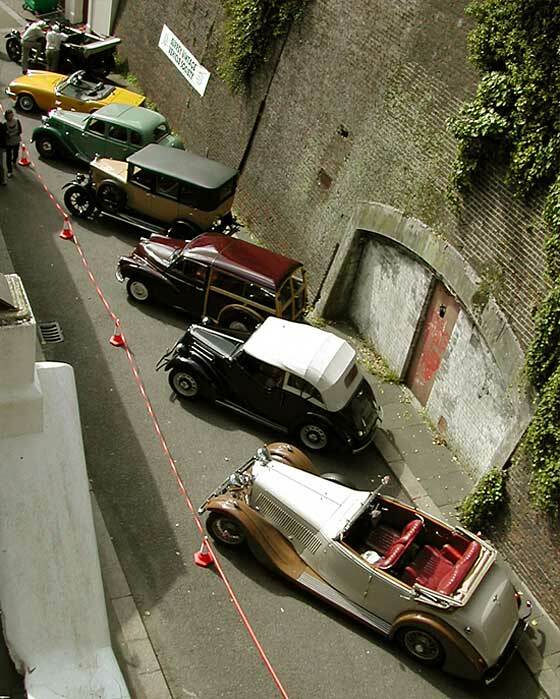 Our display in the historic Tunnel Road this year was blessed with good weather which no doubt contributed to the excellent variety of vehicles in attendance. The line-up included two magnificent Bentley's. Our Bentley boys (and girls!) 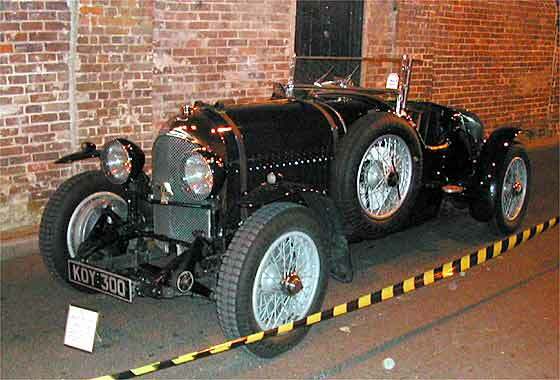 on this occasion were Clive Bracey and Hilary in the 1927 3/4½ litre Red Label two seater, and John and Margaret Chapman in their 1937 Derby Bentley with open four seat Thrupp and Maberly body, now running-in following extensive (and no doubt expensive!) refurbishment to its six cylinder 4½ litre engine. 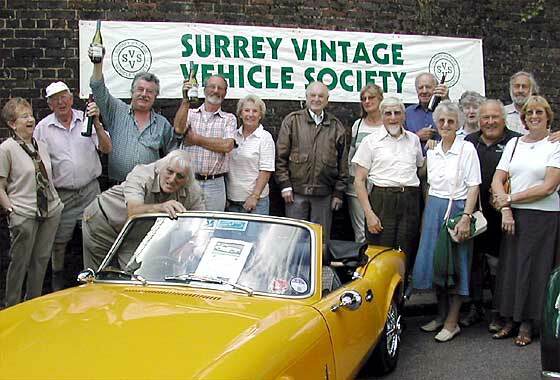 SVVS Members in Festive mood courtesy of Reigate Business Guild for providing a bottle of plonk to each participant. Others in attendance were Peter Dingle, 1923 Bullnose Morris Oxford four seater tourer. 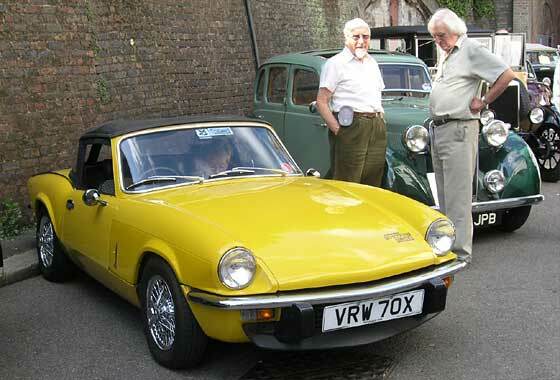 Brian and Lucy Rice, 1980 triumph Spitfire, this year without its factory hard top. Julian and Thelma Alderton, 1947 M.G. Model Y Saloon. Derek and Jacquie Wright, 1969 Morris Traveller. 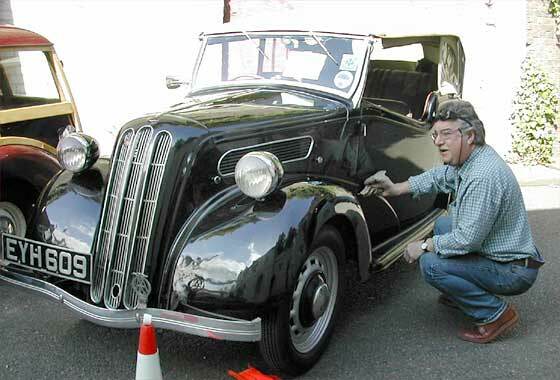 ...Tony Russell and the first time polished 1937 7W Ford 10 sports tourer. Bryan Goodman has kindly sent the following extract from Elizabeth Nagle's book - The Other Bentley Boys, relating to an incident which took place in 1929 when our venue formed part of the main road to Brighton:-"And another time, coming home," recalls Saunders, "when Stan Ivermee and I were driving two of the (Le Mans) winning cars, the year we took the first four places. We were coming through Reigate tunnel and for a bit of devilment - show off like - we both revved up like mad to change down, to hear the roar of the exhaust in the tunnel. When we got to the other side there was a policeman waiting for us, and he pulled us up. Now, while this copper was filling up his notebook a gentleman came along on foot - a very well set up sort of man. He asked the policeman what he was doing and was told he was taking our names for making excessive noise in the tunnel. 'Good heavens,' says this gentleman, 'don't you know that these cars have been upholding the prestige of English racing? These are the cars that have just swept the board at Le Mans.' 'I can't help that,' says this copper, quite unmoved. 'I've got my duty to do.' And, sure enough, we were summoned. Of course, we didn't appear in court; the firm sent somebody down, and I think the fine was £3 each or something, which the firm paid. But there you are - winning at Le Mans didn't count with the law." 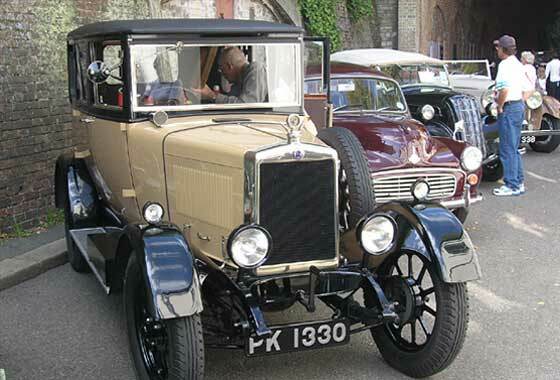 SVVS founder member Derrick Graham came with his 1927 Trojan 3-door tourer - a real working vehicle this one, with an extensive trials record both past and present. Bob and Jean Drew, 1970 Morris Minor which promptly boiled on arrival in the tunnel. 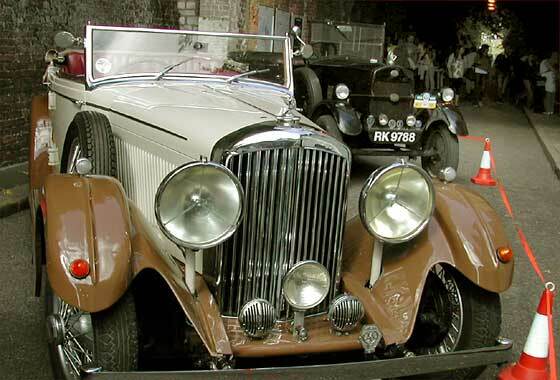 Other members appearing without cars were Edward Lake, Malcolm Bailey and John Rennie who reports that his Austin Ulster is now restored to health after major engine repairs, during the course of which it was confirmed that the engine was a genuine Ulster unit with pressure fed crankshaft, etc. As in previous years, the Wealden Cave and Mine Society were giving guided tours of the East and West Caverns which lead off from both sides of the tunnel and provided an added attraction for the public as well as the SVVS vehicles. Many interesting conversations ensued with the people viewing the display who either remembered our vehicles when in general use or learned to drive in similar vehicles or just wanted to know more about them - all part of the enjoyment. Many thanks to all those who came along and created an interesting and varied display of historic vehicles on this National Heritage Day, thanks also to Bryan Goodman for providing the amusing anecdote above, and to Tony Russell for organisational support and to Reigate Business Guild for providing a bottle of plonk to each Member.